For those of you who can still access Batangbaler via this blog, the main BB server is down because it has reached it’s bandwidth limit for the month. It means that the main website cannot be accessed including the guestbook, messageboard and all pictures located in the server. Things will be back to normal by March 1, hopefully with new updates. Please inform other regular Batangbaler visitors about this. Most Akaws using the www.batangbaler.net will only get a “bandwidth limit exceeded” message. If you can read this, it means that you are using the www.batangbaler.blogspot.com address. This blog is still working because this is not located in the Batangbaler server but some pictures will not be available. Batangbaler has a 5 GB bandwith allocation per month, the highest in the webhost package. Usually the average 300 to 400 visits per day on the site does not even consume half of this bandwidth. But because of horny Pinoy’s frantic search for the Ethel Booba video, traffic to BatangBaler now reaches more than 1000 visits per day, more that double the average. And that’s because Ethel Booba once had a show here in Baler that BB covered. BB don’t have the Booba videos. That coupled with legit visits to see the latest Aurora Day 2005 pictures used up all of BB’s bandwidth. So see you on March 1 peeps. Hang on tight. We have tons of updates for you. Ms. Anne Roberts and friends and families from U.K.
Ma. Nympha Poblete also from Chicago. 100% of the profits will be going to UNICEF for their relief efforts in Quezon, particularly the towns of Real, Infanta, Gen. Nakar, Polilio Island (Quezon Province) and Dingalan (Aurora Province). The gig went well and all events flowed smoothly. Not as pompous as the previous Suman Festivals (this year the festival for the suman was officially dead). With a relatively modest budget of 1 million pesos (according to the Philippine Star report posted below) this one looks like all those bucks went where they really should belong. Kudos to the Governor and her officials as well as Mr. Christopher Gonzales, the new Tourism Officer and the Chairman of this year’s celebration. 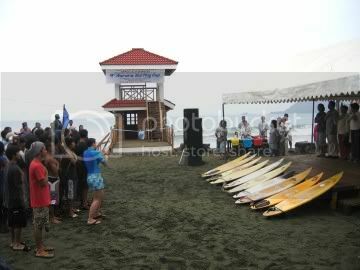 The opening of the 9th Aurora Surfing Cup at the Labasin Beach on February 15. The new watchtower was also inaugurated. 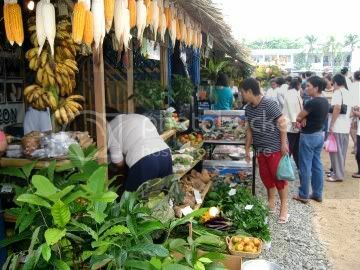 Also on February 15, the Agro Industrial Trade Fair was opened at the Capitol Grounds. A Beach Bazaar was also opened at Labasin. 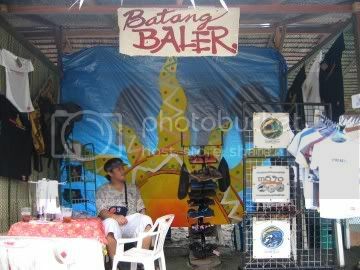 The Batangbaler booth at the Beach Bazaar – sun, sea, and shopping. Most of the booths were food shops and there were three tattoo shops but the top grossing store was the unofficial Ka Siming’s sari-sari and turo-turo. Aurora Pop Superstar. The best singers and dancers competed during the Tuklas Talino contest at the Capitol on the night of the 15th. With the program title I first thought it was a quiz bee. from the Philippine Star. Calamity-ravaged Aurora back on its feet. Less than three months after killer typhoons brought its people down on their knees, this third-class province has made a triumphant recovery, celebrating its 26th founding anniversary with pomp, pageantry and glamour amid the recent devastation. As if to announce that Aurora is back on its feet, provincial officials led by Gov. Bellaflor Angara-Castillo, Vice Gov. Annabelle Tangson and Rep. Sonny Angara joined their constituents in a week-long festivity filled with fun, merriment and hope. There was a festive atmosphere in this capital town, highlighted by a fireworksâ€™ display and street dancing, lifting the spirit of local folk who, in late November, reeled from the typhoonsâ€™ swath of destruction. Last night’s winner of the Bb. Aurora 2005 Pageant is Ms. Dingalan, again. What the town lacks in forest cover it makes up with beautiful girls. 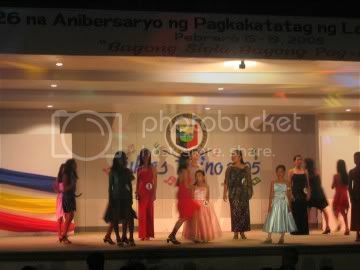 I think half of all Ms. Aurora winners since 1987 were from Dingalan. With two wins in a row everyone were shouting – Tong-Its! That’s the expression used by Tong-its (a kind of card game loved by Aurorans) players when a player wins two in a row – a slang of “two hits”. Ms. Baler won Second Runner-Up, and Ms. San Luis, 1st Runner-Up. Ms. Dingalan in her pink swimsuit. I don’t know her name yet. The winners with Governor Bella Angara-Castillo. More pictures to come next week. Check out the BATANGBALER booth at the Beach Bazaar on February 14 – 19, at Labasin near Bay’s Inn. This is in line with the Aurora Day celebration and the 9th Aurora Surfing Cup. Lots of “original” Batangbaler and Pasirit tshirts as well as other stuffs will be available. It’s official – Batangbaler is being pirated! We’re famous! Most Aurorans know DoÃ±a Aurora Quezon only from her statue at the Capitol. Here’s her real picture side by side with the sculpture. Can you see the striking resemblance? On February 19, 2005 Aurora will celebrate it’s 26th Foundation Anniversary and the 117th birthday of our lola, DoÃ±a Aurora Aragon-Quezon. The event has always been billed as a double celebration. But do you know that Aurora, the province, was not really founded on February 19 and on that date this year, Aurora will be 5 months and 24 days short of it’s real 26th anniversary. Batas Pambansa Blg. 7, the law that created Aurora Province was actually signed by President Ferdinand Marcos on August 13, 1979. Maybe there’s a resolution somewhere in the vaults of the Sangguniang Panlalawigan moving the date of Aurora’s Foundation anniversary celebration from August 15 to February 19. I’m only in my historian mode and that ends my lecture.